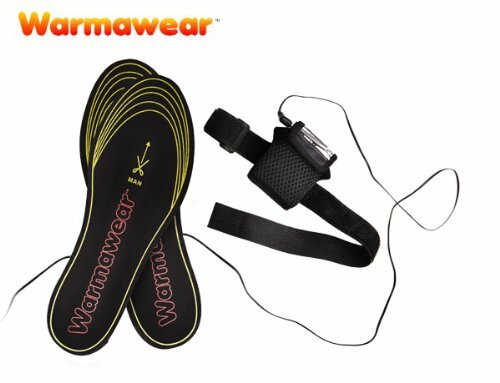 These heated boot and shoe insoles are strong, durable, comfortable and very warm. The heating element runs down the entire length of the insole which is especially useful whilst travelling on the ski lift, or even if you have a long wait at the bus stop in the winter. Invaluable for people who suffer from cold hands or feet, such as those who suffer from Raynaud's Disease, The temperature of your hands and feet will dramatically affect the ambient body temperature, so keep your extremities warm. The insoles feature an advanced battery operated heating system, which circulates gentle warmth around the feet running down the whole length of the foot including the toes - which are the areas most prone to the cold. Supplied with battery boxes and garters to attach to your leg. When switched on, they will heat your feet up quickly yet gently with over 3 hours of hot time from good quality batteries. This time can be dramatically increased if you only have them switched on for short bursts. Specifications Available in one size which can be cut down to fit almost any size shoe or boot, but should work well with any size between UK 5 and UK 9 As a rough guide to help you to decide which size you need, there are lines marked out on the insoles, we recommend cutting them down gradually- bit by bit to achieve the best fit Each battery pack requires 3 standard or rechargeable 'AA' batteries for each side (not included). Rechargeable batteries will be fine, but we recommend you go for the higher rated ones (2400mah ) Unisex design is ideal for both men and women. Please Note: Our research shows that although the Duracell lasted the exact same length of time, the insoles using Panasonic Pro Power batteries was noticeably warmer.